One Eternal Day: "Then let our songs abound"
I have the responsibility of planning worship for our small congregation in the month of June. I decided to do a series of services that each week used hymns by a single writer. We have already done services using hymns by William Cowper and John Newton. 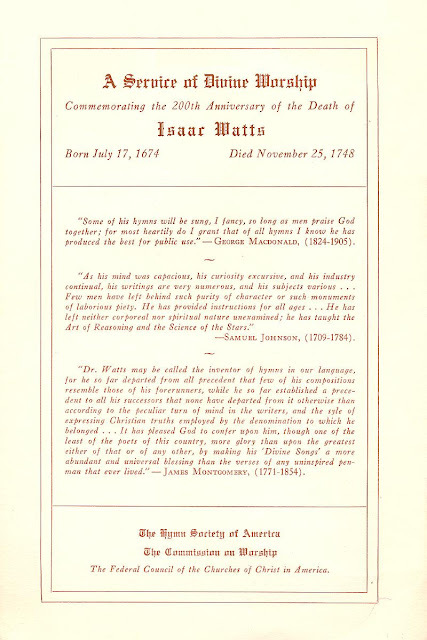 Tomorrow it will be Isaac Watts based on a 1948 200th anniversary commemoration of his death. My Skaggs grandfather apparently preserved the bulletin below. I have somewhat modified the service. Leader: O Come, let us worship and bow down: Let us kneel before the Lord, our Maker. People: For He is the Lord, our God: and we are the people of His pasture, and the sheep of His hand. And men shall be blessed in Him: All nations shall call Him blessed. God our Father, grant that Thy praises may evermore be enriched and made glorious by the songs of your people born of the Spirit. May we ever sing with gladness in our hearts because of the joy we have in Thee. Let Thy Spirit so dwell in the hearts of Thy people here and everywhere that we may truly and worthily give praise to Thee. Grant that all who here find joy in worshiping Thee may be numbered at last with those who will sing a new song before Thy heavenly throne; through Jesus Christ our Lord who liveth and reigneth with Thee, O Father, and the Holy Spirit, ever one God, world without end. Amen.